Today’s the day! Although a few different years could be pointed to as the beginning of the Apostolic Church (after all, many of our Welsh assemblies had their centenaries several years ago), the national church has chosen to celebrate 2016 as our centenary (technically the centenary of when the Apostolic Church became a separate denomination – I’ll write more about the question of when the Apostolic Church began another time). And the day in 1916 that this centenary looks back to is 8th January. 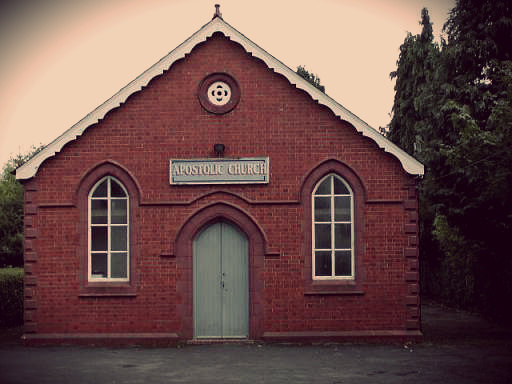 On 8th January 1916 a meeting took place in Ammanford Apostolic Church (pictured above) which saw the breaking of ties between the Welsh Apostolic assemblies and William Oliver Hutchinson and the Apostolic Faith Church movement which he led. (Hutchinson was beginning to significantly depart from evangelical Christianity, and so all British Pentecostals, not only the Welsh Apostolics, cut all ties with him and his movement.) 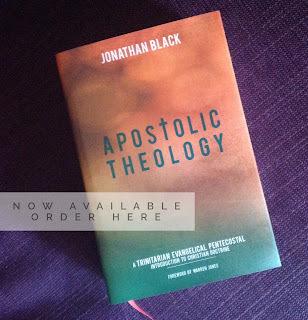 So if 2016 is the centenary of anything, it’s the centenary of a stand for evangelical Christianity (with the Welsh Apostolics standing firmly for the infallibility of Scripture, rather than a man) and of a stand for the Apostolic Vision of the Headship of Christ (with the Welsh Apostolics standing for Christ’s Headship of the Church, rather than the headship of a self-proclaimedly infallible man). It was a theological stand. And, as Donald Gee (the great AoG leader) put it, it was all down to the ‘grave errors’ of Hutchinson. 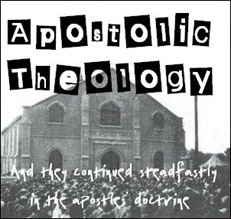 And in the 100 years since 1916, the Apostolic Church has continued to stand for both Evangelical Christianity (with its emphasis on the inerrancy and authority of Scripture, the substitutionary death of Christ, justification by faith alone, and the need to preach the Gospel to the lost) and the Apostolic Vision (with its focus on the eternal purpose of God for Christ the Head and the Church, His Body). 100 years ago, the Apostolic Church consisted mostly of poor miners and farmers in rural villages in Welsh-speaking West Wales. Some of our earliest leaders struggled to learn English. There were no great financial resources, no hugely influential people in society, and they were far, far away from London and the great communication centres of the Empire. Yet they had Christ and His Word. And Christ, the Head of the Church, built His Church among them, and from those humble beginnings, He used them to ‘belt the globe’ with the gospel. 100 years later, let’s follow the example our forebears, and trust in Christ to build His Church by His Word (rather than trusting in finances or worldly influence). And like them, let’s stand firm for the Christ-centred truths of Evangelical Christianity and the Apostolic Vision. Born to save our sinful race. Great love of the Trinity. He’s redeemed us from the Fall. Forever by Your grace so free. He belts the globe with His Great Purpose. O the grace of Christ our Head! P.S. Lots of people have been asking me in recent weeks about the date of the Ammanford meeting of 1916. There seems to be a bit of confusion because we’re having a special centenary thanksgiving service in a week’s time in Penygroes. But the 15th is only the date of a service in 2016. The events of 1916 took place on 8th. So today is indeed the day!